About 10,000 London Underground workers will vote over strike action in a pay and job cuts dispute, the Rail Maritime and Transport union (RMT) has said. London Underground (LU) has said 1,000 jobs will be lost at the firm and several hundred more are likely to be axed at Transport for London (TfL). The RMT claims up to 3,000 jobs are at risk in total. 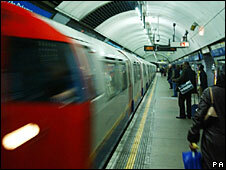 TfL said it was "disappointed" with plans for the strike ballot as it will "not resolve these separate issues". Workers, including drivers and station staff, will begin voting from Tuesday and the ballots will close on 8 April. The expected job losses come after Tube maintenance work was brought in-house following the collapse of Metronet. TfL said many posts under threat were jobs that were duplicated as a result of the merger. The RMT wants TfL to withdraw the threat of compulsory redundancies, which they said was a part of TfL's plan to save £2.4bn. The RMT's general secretary Bob Crow said: "London Underground seems to think that observing agreements is optional and its plan to cut jobs is simply unacceptable. "After three months of stonewalling LU has also tabled what is at best a five-year pay freeze - which it knows full well could never be accepted - and its managers appear to have been given the nod to unleash a fresh round of bullying." A TfL spokesman said: "We are disappointed that the RMT is planning a ballot for industrial action, as it will not resolve these separate issues." On a pay freeze he said: "We seek a further fair and affordable long-term agreement that seeks to provide stability for our staff in a period of great financial uncertainty." He added: "Across TfL, we are conducting a review of costs... Where a reduction in jobs is necessary, we will seek to avoid compulsory redundancies." The spokesman said the job losses will have "no impact" on Tube services as frontline staff working on trains and stations and maintenance staff were not affected. London Mayor Boris Johnson said: "It will do absolutely no good to hard-pressed commuters to have a strike in difficult economic times."